Posted in Boating San Carlos, San Carlos Attractions, San Carlos Mexico Diving & Snorkeling, Things to do with Kids, What to Do? Discover beautiful and exciting San Pedro Island! 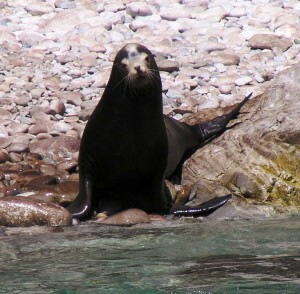 Snorkeling & Diving with the Sealions at San Pedro Island is only 1 – 2 hours from San Carlos Sonora Mexico (depending on the speed of your boat). San Pedro Island is a steep, rocky island covered in large cordon cacti on the upper slopes and a layer of white seabird guano on the lower slopes. Sea lions frolicked in the surf and sunned themselves on rocks.Even if you don’t want to venture into the water with the sea lions, watching them from the comfort of a tour boat is almost as rewarding.We were lucky enough to have a pod of dolphins swim alongside the boat and play in its wake. The chances of spotting dolphins on a trip to San Pedro are high as they often feed in the water between the island and the mainland. Sperm whales also often gather close to the island to feast on the large squid found in these waters. The island is also an important seabird nesting site. During our tour, we saw flocks of Brandt’s cormorants, brown pelicans, brown boobies, and yellow-footed gulls. I was disappointed to not spot one of the blue-footed boobies that call this island home. 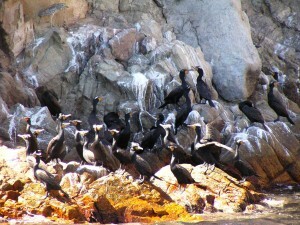 Since the 19th Century, the mining of seabird guano at San Pedro has contributed to the local economy. The island further contributes to the economy in numerous ways. The abundance of marine mammals and seabirds at the island attracts ecotourism. And the large quantity of fish around the island draws both commercial fishermen and private sport-fishermen. In 2002, recognizing the importance of the island to the local economy and ecology, the Mexican government declared San Pedro Island and its adjacent waters an ecological reserve. The government is working with not-for-profit groups on restoring, protecting and conserving the island and the surrounding waters. The reserve has a “no take” zone of just over 11 km where fishing is not permitted, and a 290 sq km buffer zone where fishing is regulated. Numerous companies in San Carlos offer boat tours to the island, many of which include diving, snorkeling and/or fishing packages. Among those in San Carlos are Sonoran Sport Center, Gary’s Dive Shop and Ocean Sports. A great spot to snorkel, scuba dive, fish, kayak, or just go for a boat tour and nature watch. A large grey shadow passed silently beneath me, and my heart skipped a beat. A school of brightly colored king angelfish had captured my attention and I momentarily forgot about the sea lions that surrounded me. 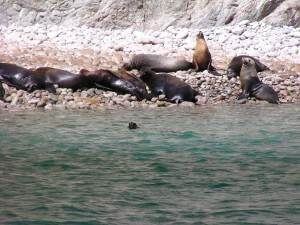 I was snorkeling with sea lions at one of Sonora’s primary dive, snorkel and fishing sites, San Pedro Island. After a two-hour motor boat ride, we had arrived at San Pedro Island, which is about 17 miles (27 kms) from San Carlos. 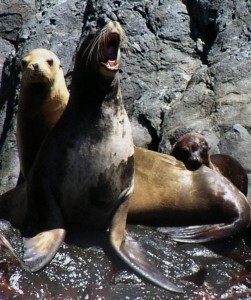 We had come to swim with the year-round resident California sea lions. 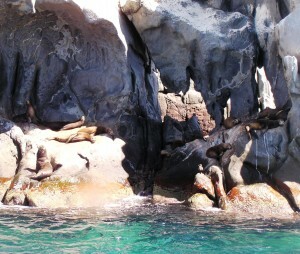 We found a group of about 22 sea lions in a small rocky cove at the island. We quickly put on our snorkel gear and jumped in the warm water. 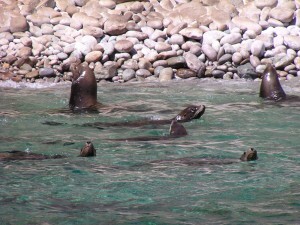 The sea lions barked their greetings and warnings, and then slipped into the water to get a closer look at us. I had been told that the bulls can be aggressive, but that they rarely bite. Still, I was nervous around such large mammals. Adult males can reach 8 feet in length and weigh up to 600 pounds, while adult females can get as large as 6 feet and 200 pounds. The bull and several of the females looked like they had reached their full growth potential, and made for intimidating swim-mates. However, their playful curiosity quickly won me over and I began to relax and enjoy myself. A pup was particularly inquisitive, and would swim close to us, twirling around, and trying to get our attention. There was excellent water visibility, and in addition to the sea lions and angelfish, we saw schools of numerous other fish including needlefish, wrasses, damselfish, blennies, and the ever-present sergeant majors.Though it seemed like a “once-in-a-lifetime experience”, I look forward to again encountering the sea lions at San Pedro Island — maybe in a kayak next time!Many companies in San Carlos offer boat tours to the island, which include diving, snorkeling and/or fishing packages.